The first day of summer this year is June 21st, and we want to make sure your wardrobe is set and ready to go! A core part of any gal’s summer closet is her selection of jean shorts. This season it’s out with the “plain jane” styles and in with detailing that will give your shorts (and outfits!) a brand new look. In our opinion, no brand does this better than Machine Jeans. Their unique destructed look and finish makes them a brand of choice for young trendsetters and those with a hip sense of style. Check out our 3 favorite Machine Jean shorts of the season: high-waisted, crochet rim, and acid wash.
Don’t miss out on high-waisted denim shorts this year. They pair great with crop tops and their high-waisted rise will leave you feeling comfortable all day. Not to mention how you’ll get to show off your sun-kissed legs! Check out our Machine Jeans denim shorts in white for a classy yet cute look. These Machine Jean shorts with white crochet trim are the hot item this summer. The crochet trim leaves you with a sweet, scalloped finish. Pair them with a Patrons of Peace Aztec bohemian tank top to complete your boho-inspired look. Acid wash shorts are the perfect casual shorts for this summer season. These Machine Jeans acid wash shorts have a zipper on each side to show off the fly-away look. We love pairing these shorts with a tank top or swimsuit top to hit the beach! Hello, Everyone!!! Hope you’re all having a Happy Friday! It’s been such a busy week filled with work, holiday prepping, and (most importantly) new activities here at Glik’s HQ, which I am super excited to share with you all! So, we’re all fans of Instagram right? That app has become the heart and sole of my smart phone. I buy editing apps to use with it, get called out on a daily basis for taking too many photos of my food, and look completely awkward trolling around the office and pretty much the general public with my phone taking “interesting” angle shots. It’s an addiction, I will fully admit to needing a possible 5 Step Plan (as if). Instagram is fun, addicting, and a great way to connect with so many other people, brands, businesses, and non-profits that share the same interests as you. Everyday I check the @GlikClick account and come across some great style photos that we have been tagged in. It’s so cool to see everyone’s individual style and how they translate that to the world around them. Love how @binksandthebadhousewife styled this maxi skirt! Check out her blog at binksandthebadhousewife.com. @katelynnbrendly shows us her bright summer style. @tsheid01 knows how to play up a floral skirt. @nimthenarwhale pairs a denim jacket with her summer dress for a cute outfit! @taylorkaitlynn gives us two outfit options. @pwallaa93 looking lovely in chevron. You can find all of these cute fashions at gliks.com or by visiting your local Glik’s store location. I would like to invite you all to share your Glik’s Style with us on Instagram by tagging @GlikClick or hashtag #glikstyle. Hey everyone!! Our buying team traveled to LA this week to find 9 of the latest and trendiest fashions just for you! Now we’re going to let you all put our style to the test and vote on your top 5 favorite fashions! Here’s how this contest works. You have all weekend (June 7-9) to go to our Facebook page and vote by “Liking“ the style you love most. The ballots will be closed by 12 noon on Monday, June 10th. Our team will be working diligently all week to get these items ready to launch online! Once all of your votes have been carefully tallied, the winning item will then be available for 50% off exclusively online only from June 14 until June 17 at noon. The top 5 items will be available at gliks.com at regular price. NOW, let the voting begin!!! Don’t forget to find @GlikClick on Instagram to see more behind the scenes photos! 1. Bold Prints: From chevron to aztec, and everything in between, bold printed tops are the way to spice up your summer wardrobe. 2. White Denim: White goes with anything and everything! Shorts, capris, or jeans, get them all in white to make your tops pop. 3. 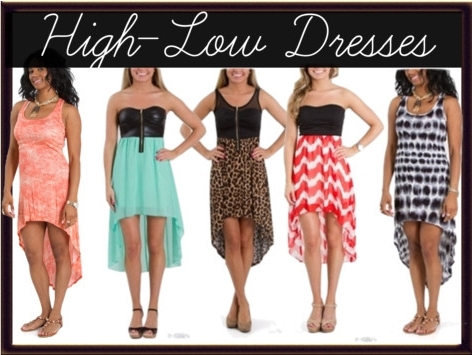 High-Low Dresses: This is a huge trend! 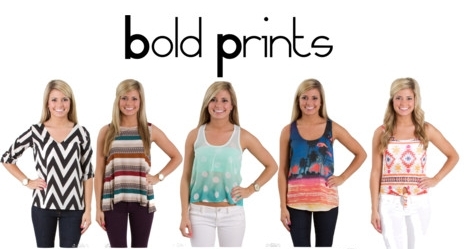 Different lengths and prints are available for whatever occasion you need. 4. Frayed Shorts: Cut-off shorts and a plain tee is the perfect look for a day on the beach or shopping around town. They come in so many different washes and prints, what’s a girl supposed to do except buy them all?! 5. 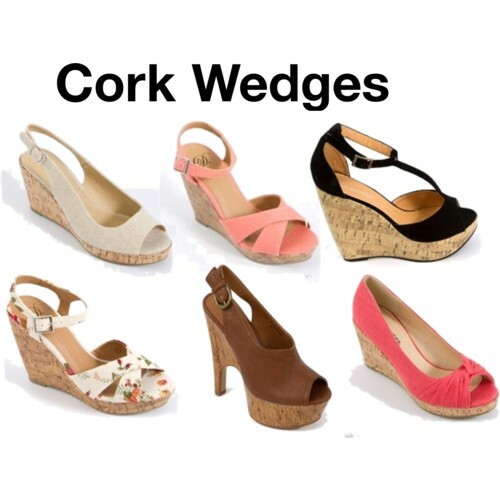 Cork Wedges: Wedges are always a summer must, but this season cork is the material of choice. Comfortable and support, cork wedges can tie your whole summer ensemble together! Check out tons more styles similar to these at one of our Glik’s locations or online at gliks.com! A maxi dress is a key essential for those days when the sun is bright and there’s just a little breeze. A dress or a maxi skirt that’s bright, summery and cool enough to layer with tank tops and fun denim vests will always be a must have to pack for roadtrips or vacations. We love maxi’s that have bold patterns, embroidery and cool details on them, like the Black Moon Rise maxi dress. Whether it’s a vacation with family, roadtrip with friends or just a day spent out and about, the versatility of a maxi can be easily transitioned from day to night. Just add a few accessories, a pair of gladiator sandals and a lightweight jacket to create a fun-loving outfit. Here are a few of our favorite maxi dresses and skirts for summer. Chevron is our must have print of the summer. Love how versatile this pattern is! Visit us at gliks.com for more maxi dress and skirt styles! All of the photos from our buying trip to MAGIC have been uploaded and organized, FINALLY. I can’t believe that this time last week I was in Las Vegas hanging out with the buying team and exploring what seemed like hundreds of vendor booths. My trip seemed like a blur even though we extended our stay an extra 2 days (not by choice) due to the crazy Midwest snow apocalypse. WWDMAGIC is held in collaboration with Women’s Wear Daily and runs for three days. This event features on-trend fashion forecasts, networking events, seminars and all the current styles of the season. WWDMAGIC features more than 2,000 new & established brands that range across every price point and follow up-to-date trends. We only had enough time to visit 3 shows. WWDMAGIC features the most current and wide-ranging collection of women’s brands. FNPLATFORM is the shoe show at MAGIC. PROJECT MENSWEAR features an extensive collection of men’s fashion brands. MAGIC holds more shows that feature all aspects of the fashion industry, but we only attended these three, and three days wasn’t nearly enough time to properly explore the shows that we did visit. Here are a few more photos from the event. To see the full album, visit us on Facebook! Chevron. We suggest you stock up on this trend! Love this BB Dakota dress! New brand love! We discovered Naked Zebra while at WWDMAGIC and placed a huge spring/summer order! Camo & print patterns were allover Men’s PROJECT. We had dinner reservations at the Cosmopolitan Hotel. It was the three-story chandelier that caught our attention first! A bit of dancing was had during the Levi’s Party held within the Marquee nightclub. We visited with Free People on our last day at WWDMAGIC. Loved their booth. We were able to spent the last portion of the show browsing the booths for new fashions. Find out what we found by visiting us on Facebook! It’s an otherworldly city, in the middle of the desert, filled with lights, outlandish occupants, entertainment, and most importantly, Magic. I’m not referring to the David Copperfield show at MGM Grand. No, I’m referring to Magic Trade Show, and the Glik’s buying team traveled to Las Vegas, Nevada this week for the sole fashionable purpose of style. This monster of a convention plays host to shoe, apparel, and accessory brands from ALL over. If you’re in retail, no matter what your division, this is the place to be. Literally, there is so much going on in this small 72 hour window of time that–if you’re not careful– you have a chance of loosing your mind to sensory overload. Here’s just a sneak peek of what happened in Vegas. Day 1: As soon as the Glik’s team landed we checked our luggage and headed straight to the show. I spent the day with the Woman’s buying team at Magic. Day 2 was spent with the men’s team at Project. Looking at new styles of 1897 denim. New brand alert: Trademark Brooklyn Cloth. Day 3 was spent with the women’s team again at Magic. We met with morning appointments then spent the afternoon looking for new fashion brands. Late afternoon we learned our fate. Our flight had been cancelled and we were stuck in Las Vegas for an extra day. Drat! We had to make due with our unfortunate circumstance by working poolside while under the attentive eyes of Glik’s President, Jeff Glik and Vice President, James Glik. We can’t wait to share with you more photos from Magic Trade Show! Stay tuned!! Chevron. There is definitely a bit of history behind this zig-zag print. It has been seen in badges, architecture, and as far back as ancient pottery, but in 2012 the chevron pattern emerged and evolved into a popular trend in the fashion scene. What more can we say? There are many fantastic qualities to behold when it comes to this geometric print, but we believe its best attribute has to be its versatility. Whether the zig-zag stripes are close together or far apart, in bold colors or subtle hues, you can achieve a range of drastically different “looks” with this pattern. Even used as a small accent or as a statement piece, Chevron has the ability to vamp up any wardrobe! We can’t go on without sharing another wonderful quality of this print … it has a totally adaptable, do-it-yourself quality as well Due to the simplicity of chevron’s pattern, it has become a “go-to” design for crafters from all different walks. Just visit any Pinterest board and you can see the famous zig-zag print being painted on everything from picture frames to rugs, walls, home decor and even being used in re-purposing old furniture (we suggest checking this out). Bottom Line: Chevron’s versatility makes it a must-have for your closet.